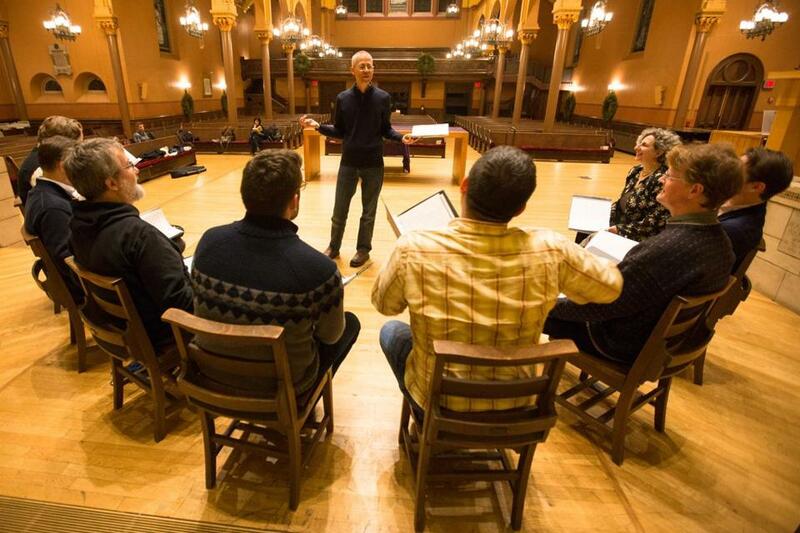 Music director Scott Metcalfe with members of Blue Heron during a rehearsal by the vocal ensemble at First Church in Cambridge, Congregational. Back in 2007, when Blue Heron, the virtuosic and intrepid early-music chorus, put on its first Christmas concert, it was stocked with esoteric fare: 15th-century English carols, Burgundian part songs, even a few motets from Cyprus. Most of it was stuff that few if any listeners would’ve heard previously, an unusual gambit for a season in which we prize the well-known, the comfortable. If the odds were against these adventurous programs becoming a hit, they have long since been overcome. Blue Heron’s Christmas concert, whose fare now alternates annually between France and England — this year it’s “Christmas in Medieval England” — is a recognizable element in the city’s holiday ecosphere. Three performances in Cambridge this weekend come on the heels of a brand new CD of the same name, recorded during 2013 performances. Having this kind of program become a familiar local marker “is a really different experience for us, because so much of what we do is music that none of us has ever done before, and very few people in the audience have ever heard before,” said Scott Metcalfe, Blue Heron’s music director, in a recent interview. “This is still pretty obscure repertoire, but the fact that we’re coming back to it every other year for several series,” he said, has changed the audience’s attitude toward the unknown. And a planned collaboration with Jessie Ann Owens, a musicologist at the University of California, Davis, recently received the American Musicological Society’s Noah Greenberg Award, a prize honoring partnerships between performers and scholars. The award will partially fund a recording of the first book of madrigals by Cipriano de Rore, an important 16th-century Franco-Flemish composer whom Owens has been researching since her graduate-school work. “It’s a seminal book of madrigals by one of the big names of the 16th century,” Metcalfe explained, including an unusual cycle of sonnet settings, many by Petrarch. “But there are [only] two or three madrigals out of the set that have ever been recorded. So [Owens] has all these ideas [about the music], but she’s never heard most of them done.” The Greenberg award, he estimated, will cover about 5 percent of the recording costs. As if that weren’t enough, the group will soon make a rare foray outside the world of early music when it performs Fauré’s ever-popular Requiem with the conductorless string orchestra A Far Cry in late January. Amazingly, Metcalfe himself has never performed the Requiem — in fact, he’d never even heard the piece before this year. (He hastened to point out that he’s got plenty of chops elsewhere in the 19th century.) But he was excited by the possibility, since there’s nothing preventing his group from bringing its talents to the piece. “The skills of a professional vocal ensemble, that kind of ensemble is relatively rare in the US,” he said. “And they’re equally applicable to Fauré — so you know, why not? alnotes@gmail.com. Follow him on Twitter @davidgweininger.